So I have moved my sewing enclave from the third floor in my house down to a bigger, light filled room on the second floor of the house. Ahhhhhhhh. I love it. I'm still tweeking and fluffing and primping it, but I love it. Come inside and I will show around a bit. This corner is the command corner. My sewing table is here and faces the door and I can look right out the window and see the sky and the clouds outside. I repainted my daughter's old desk and have made this my "jewelry" center. If you have read this blog before you know I love jewelry and sometimes I make jewelry. 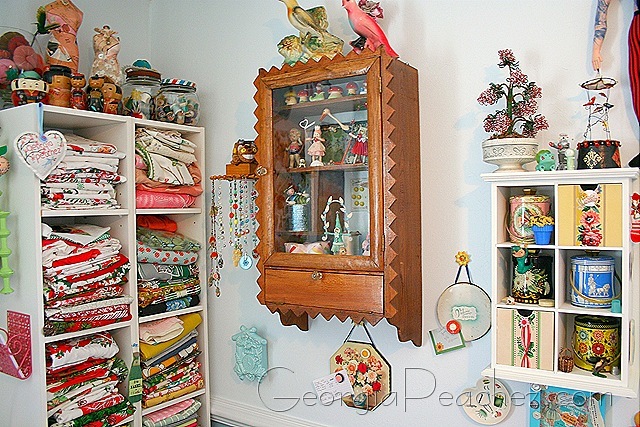 This cabinet I found last fall at the thrift store and I love it. It's handmade with a glass front. I've filled it with some special things. I used the lids leftover from this project and made a couple of small magnetic note boards. I love this little handmade spool shelf. I found that in Arizona when I was visiting my sister. 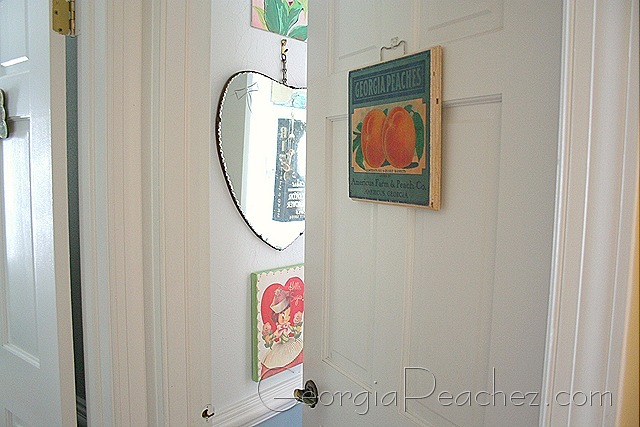 I gave it a fresh coat of apple green paint and hung it over my jewelry table. 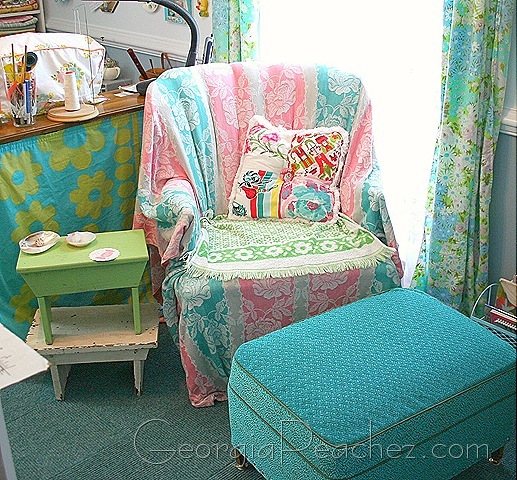 This corner is the entrance and you can see behind the door where I hung some vintage shoe organizers made from lovely vintage fabrics. 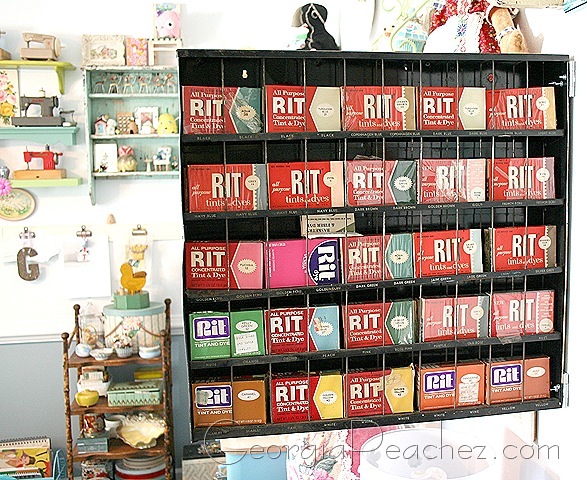 Remember the fabulous Rit Dye display piece that I found at The World's Longest Yard Sale last year? I finally figured how to display it so that you can access both sides. The back of it has cubbies for storing the Rit dye. Well, I mounted it on hinges and now I can fill it with all my vintage Rit Dyes!! I'm working on one more project for the wall, another hook rack. 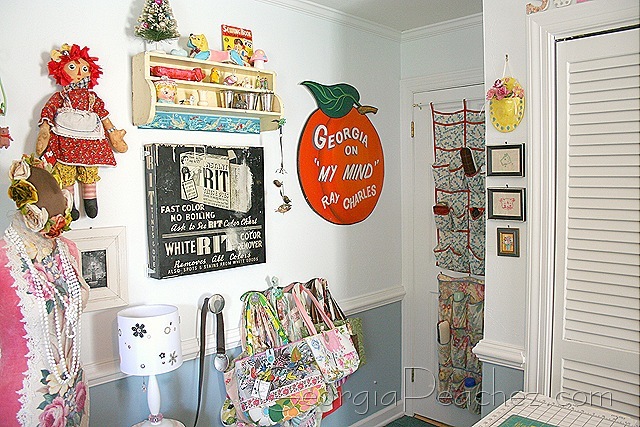 I want more space to hang up purses that I've been working on. It's going to be a project with old yardsticks. I've had a lot of inquires about the cubbies, they came from TARGET. This spot is a work in progress. I really want a chaise to relax on when I read and watch TV. So until I find the perfect piece, I will chill out here. oh so pretty! i love your cutting table. so perfect! Love, Love, LOVE your blog!!! I knew it had to be awesome when I seen your McCoy in your header!! I LOVE McCoy!!! Can’t wait to look around some more!!! Loved getting a tour! It looks amazing (and so tidy) had to double click on some photos for a closer look. Digging that Rit Dye display cabinet and glad it found a proper home! This is all so charming. You must wonderful when you are in this room. It should inspire you to be creative. I love all the things that you have made and it’s all so organized. 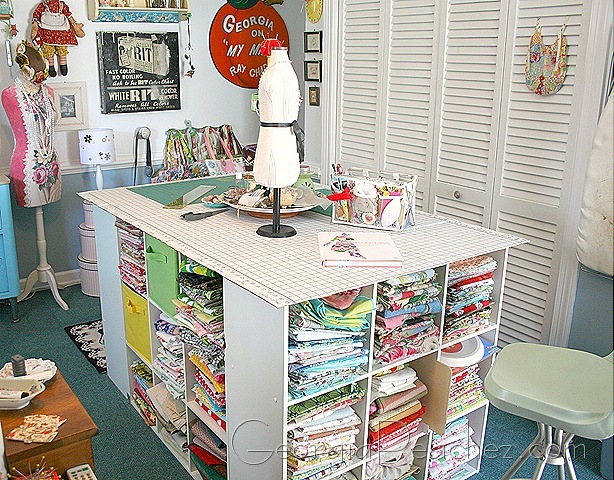 The cutting table is on my list of “I wants”. This is so practical and pretty too. What a wonderful room to create in, love it. Hope you and your family will be safe with Irene coming. Live down South and have delt with plenty of them. Wow! 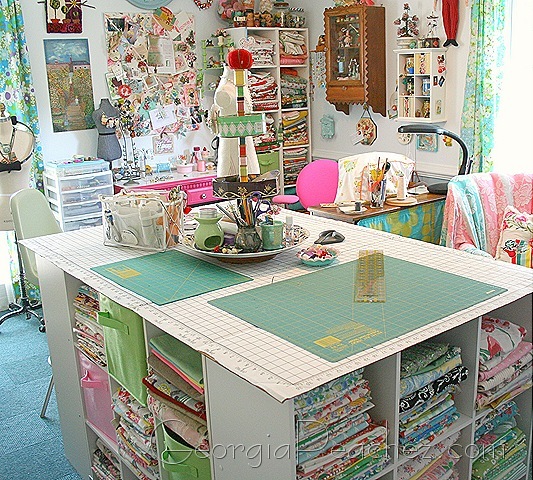 This must be the most wonderfull sewingroom ever!!! Love it! Love all the details! Wow, Suzi! I am so jealous! It is lovely. Stay safe in Irene. It is raining buckets here and I cannot imagine what it must be like there. Take care! Oh my.. 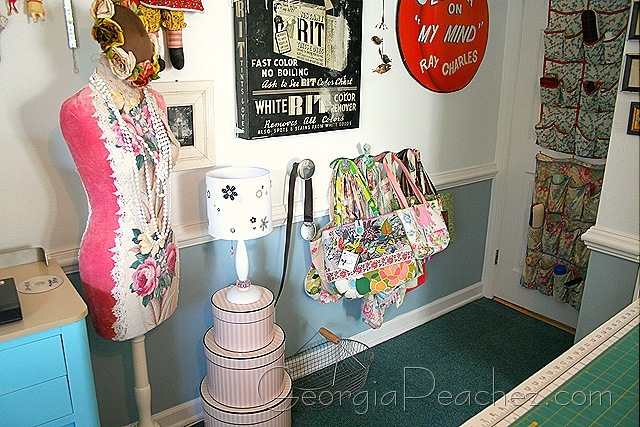 I just love your new sewing/craft room. 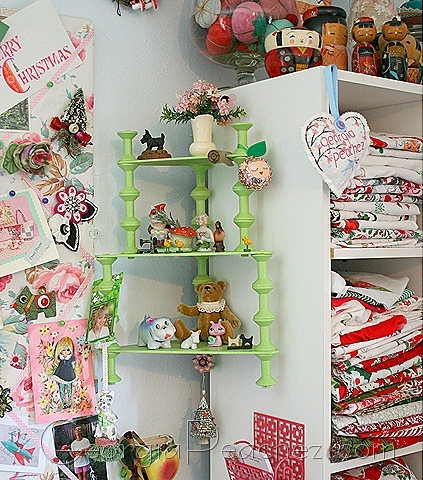 The colors are so bright and cheerful and you’ve displayed your collections in such a wonderful way. I could spend hours and hours holed up in there just crafting or dreaming away. Well, this is definitely magic Georgia Peachez wonderland! From that fantastic heart shaped mirror to the dye cabinet display…it is positively mesmerizing…I love it!! Hoping you fared well through the hurricane…we had a wet basement as expected but cannot complain! Oh!My!Gosh! All your hard work has paid off and it turned out just perfect in every way! I am seriously thinking about retiring the old kitchen table in my art room and replacing it with those cubies. I love all that function. Now I just need to figure out if I could use it as the “girls’ table” for holiday meals. 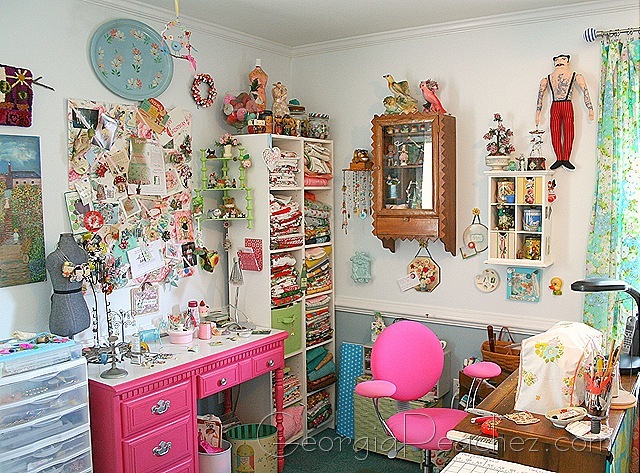 By the time you read this, I will be halfway across the country in my quest to move into and live in your studio — I love it and really want to see every little detail. What an awesome job you’ve done! You must be so inspired every time you walk in there. I can’t tell you how much I love every square inch of this room. (in particular the Ray Charles peach!) 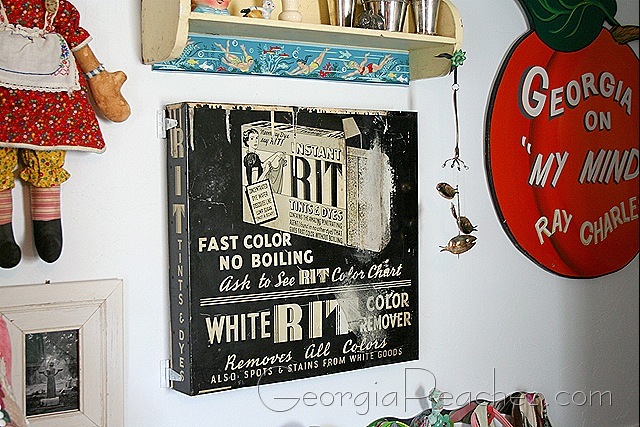 Don’t know if your spool shelf is old – either Country Living or the now-defunct Country Home had a feature about vintage spool furniture one time and how valuable it’s become. Made me love my $1 spool table even more.